Australia has, in many ways, some of the most extreme gun regulations in the world. By jumping through a great many hoops, and carefully filling out the right forms over several months, you can own and use a significant number of firearms. The regulations are a wish list of most of those proposed by gun hating activists from around the world. The were rushed through the Australian political machine with amazing speed. The trigger event was the Port Arthur massacre. The process was aided by a fully cheering Australian media and the Prime Minister, who openly hated guns. I reviewed the regulations over time. Some are simply baffling. What is the point of including BB guns in the same class as shotguns? Why are airgun pistols placed in the same category as .357 magnum revolvers? Many types of slingshots are illegal. Why, after an applicant has filled out all the paperwork, and gotten all the permissions to own a gun, do they have to wait a minimum of 28 days to pick it up? If they purchase another gun, they have to wait another 28 days. This regulation is more bizzare yet. Replica guns that do not fire anything are treated the same as real guns. Getting a gun replica sent directly to your door therefore isn’t difficult — but you will be breaking the law and the risk probably isn’t worth it. The maximum penalty for importing imitation firearms without import approval is currently $275,000 and/or imprisonment for 10 years. What is an imitation firearm? An imitation firearm is defined in section 4D of the Act as an object that, regardless of its colour, weight or composition or the presence or absence of any moveable parts, substantially duplicates in appearance a firearm but that is not a firearm. 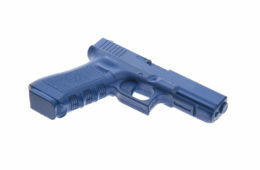 An imitation firearm does not include anything that is produced and identified as a children’s toy. A 27-year-old Sydney man on Tuesday became the first person in NSW to be charged with possessing blueprints to manufacture firearms after detectives raided his Bronte apartment. Sicen Sun was granted bail on Wednesday after Waverley Local Court heard he was “something of a fanboy” who allegedly made the guns to resemble those in TV shows and games like NCIS and Call of Duty. But Detective Inspector Joe Doueihi, of State Crime Command’s Firearms Squad, said imitation firearms were treated just the same as the real thing under the law. “He just took it that extra step,” Det Doueihi told reporters in Parramatta. The detective said Sun faces maximum sentences of 20 years for manufacturing a firearm and 14 for possessing the blueprints. But Mr. Sun did not just possess 3D printed imitations. He also had *air pistols*! If you are going to Australia, do not take any airsoft guns, do not take any replica guns. Do not take a slingshot.